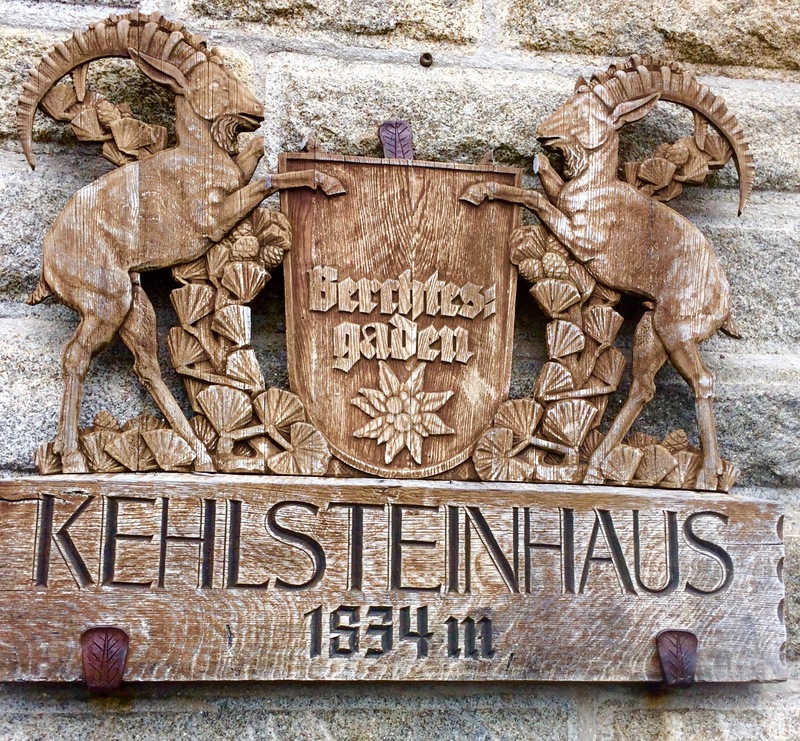 The first thing you notice about the Kehlsteinhaus, or ‘Eagle’s Nest’ is the approach road that climbs 800 metres up the side of a mountain, without the need for hairpin bends. An engineering marvel, the road contains five tunnels in its 6.5 kilometres. It was built in 1937, as part of the Eagle’s Nest – a 50th birthday present for Adolf Hitler. The Kehlsteinhaus is situated on a ridge atop a 1,834 metre mountain above the town of Berchtesgaden, in south-eastern Germany. 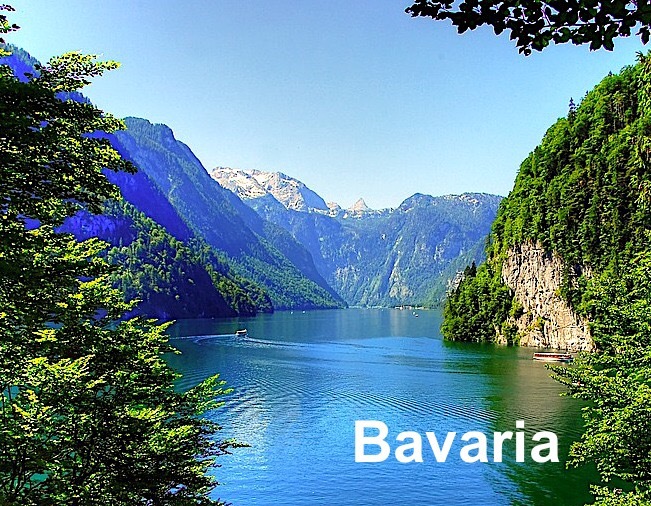 It is one of the busiest tourist attractions in Bavaria and, each year, it is visited by huge numbers of people from around the globe. The location of the Eagle’s Nest – high in the Alps – is regarded as one of the most striking and picturesque in Germany. The intention was that the Eagle’s Nest would be a diplomatic reception house and quiet mountain retreat for Hitler, but he paid only a handful of visits to the summit. The Nazi leader apparently had both a fear of heights and was concerned that the elevator to the summit might be hit by lightning. We arrived the day after a snowstorm, amid a lot of low cloud. 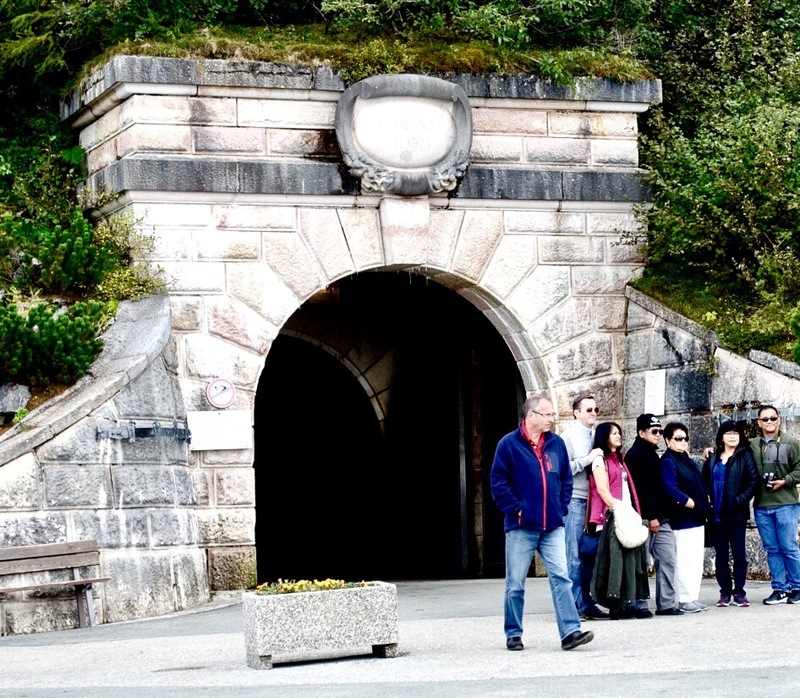 To reach the Kehisteinhaus, you first need to catch a bus from Obersalzberg on the mountain’s lower reaches, then walk through a 126 metre tunnel into the mountain. Finally, you catch a remarkable elevator that rises about 124 metres to the peak. 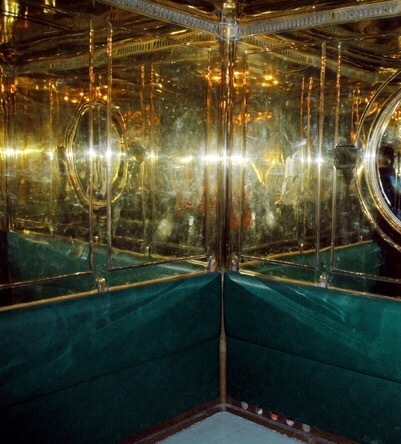 The interior of the elevator is made of polished brass and circular Venetian mirrors to look bigger than it is, as Hitler, apparently, had claustrophobia. 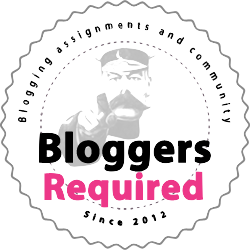 Photographs are banned in the elevator, but can be taken as it arrives and the doors open. These days, the Eagle’s Nest is a restaurant and beer house, but one particular item of interest is a grand fireplace made of expensive reddish Carrara marble. 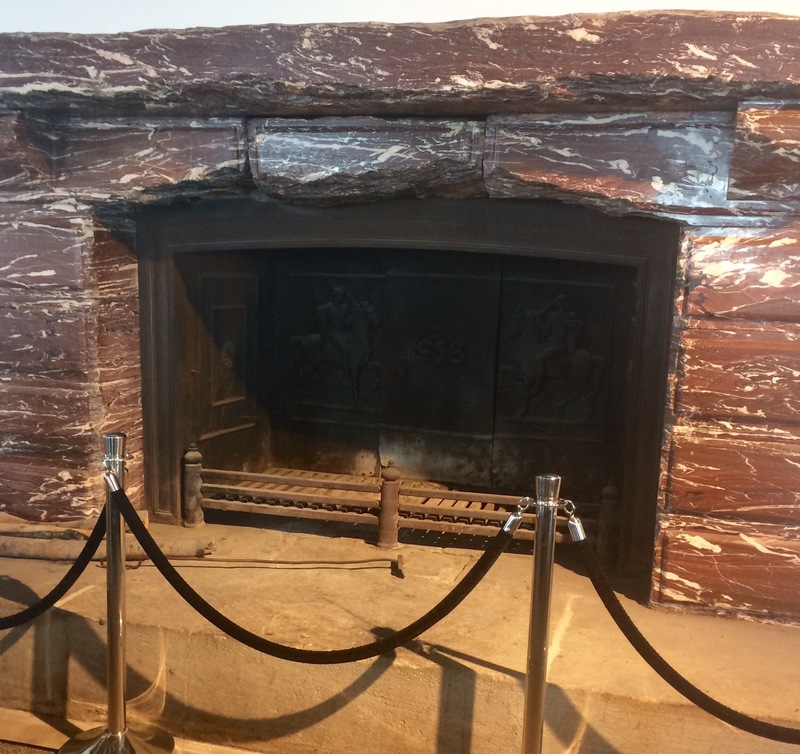 A sign says the fireplace was a birthday gift to Hitler from Italian dictator, Benito Mussolini. It is damaged at one end, allegedly by Allied soldiers who are blamed for chipping off pieces of the marble for mementos. 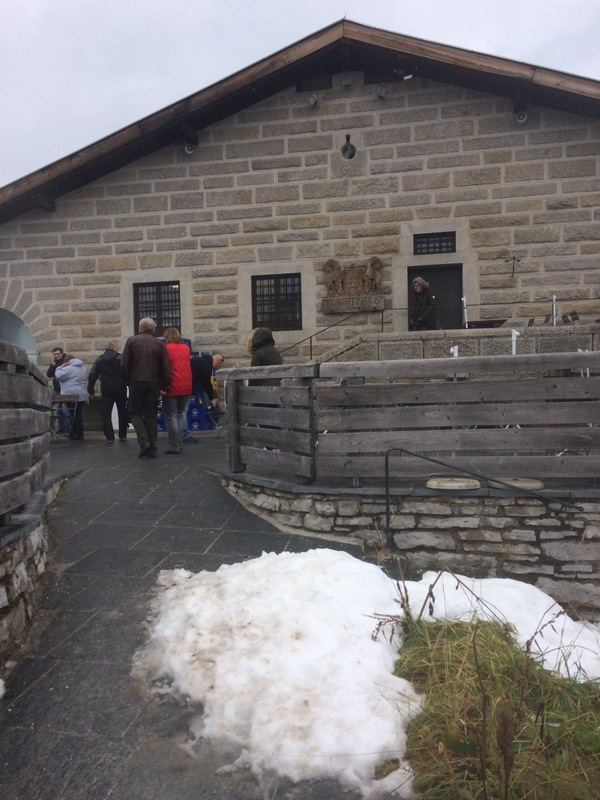 Although the beer was good and the Kehisteinhaus has great historical significance, we were particularly impressed with the Document Centre, which is located further down the mountain near where Hitler had his alpine mansion. 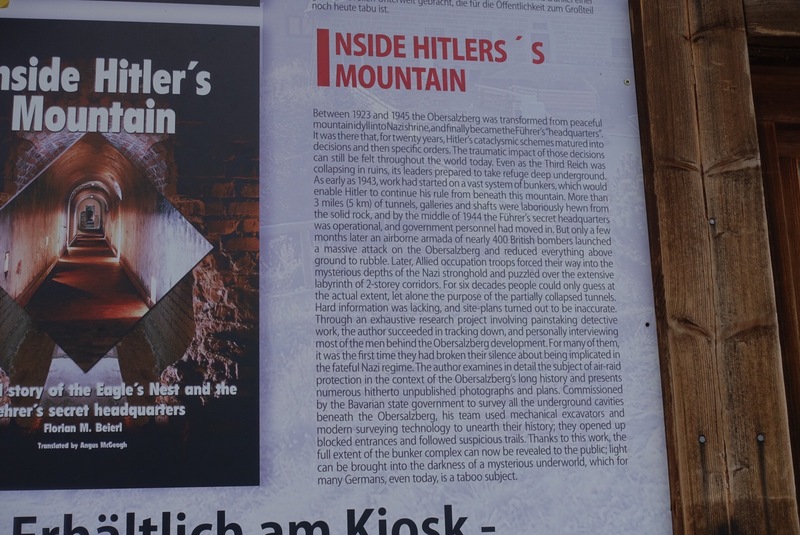 Information at the centre showed that, although bombing the Eagle’s Nest itself was not a high priority for the Allies, the presence of Hitler and many of his senior officials made the Berchestgaden a key target – and the residents suffered severely. In the last weeks of the war, in particular, there was a massive bombing attack on the Berghof and Obersalzberg. 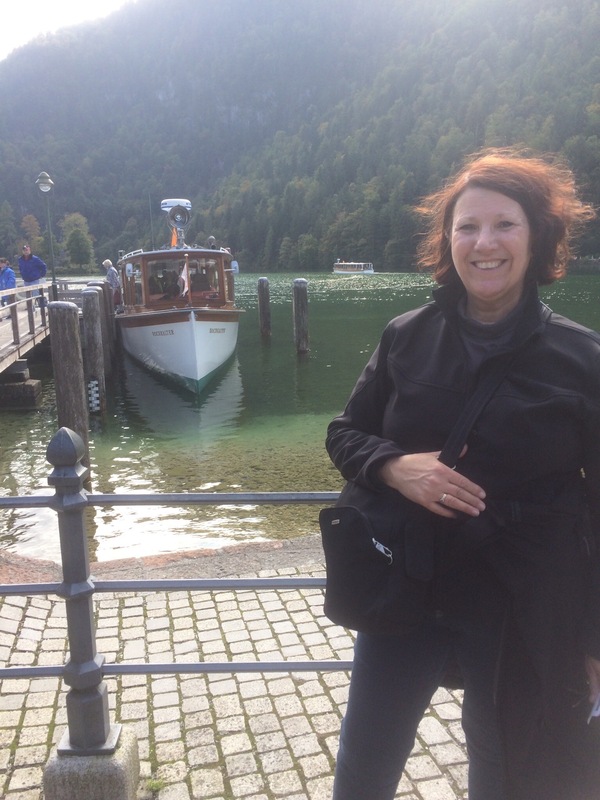 Berchtesgaden is good for the soul. This picture-postcard region, set amid the Bavarian Alps, in south-eastern Germany, is quiet, historic and scenic. In the late afternoon, about the only sounds from the quaint villages are faint traces of Bavarian music,the pearling of church bells and the trickle of running streams. The people are particularly welcoming, considering the World War II devastation suffered by the Berchtesgaden only a generation or so ago. 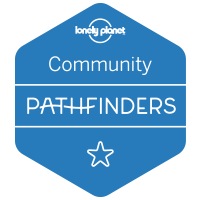 We wandered to beer halls unannounced to sample the local product – and were accepted warmly. 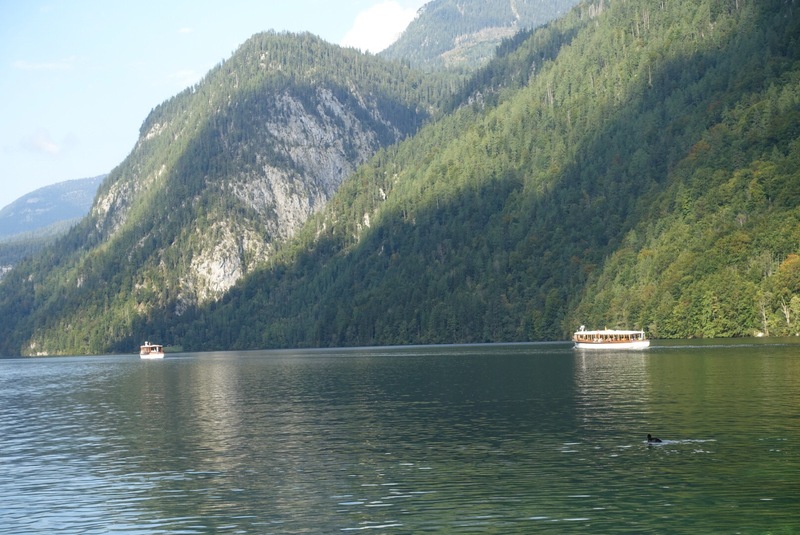 A highlight of Berchtesgaden is the emerald-coloured Lake Konigssee, which a spectacular fjord set in the Bavarian Alps. 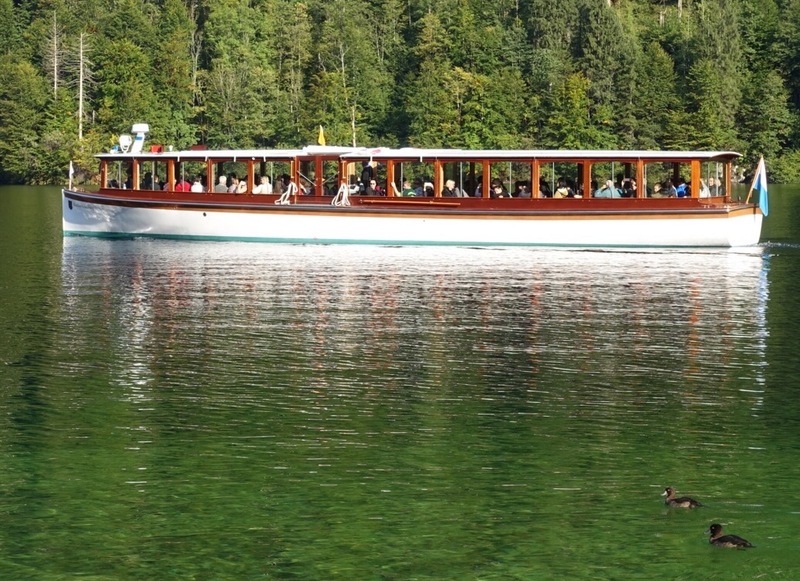 The eight- kilometre long lake nestles between mighty Alps from which tumble spectacular waterfalls. 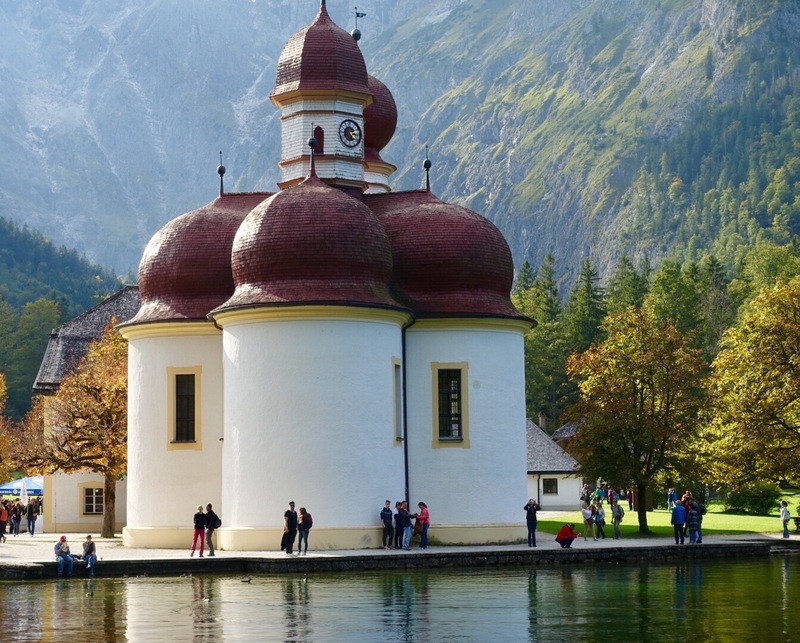 Partway along the Konigssee sits one of the world’s most-photographed structures, the chapel of St Bartholoma, which has been the site of a church since 1134. The red-domed chapel, as it currently exists, was built in the 17th Century. 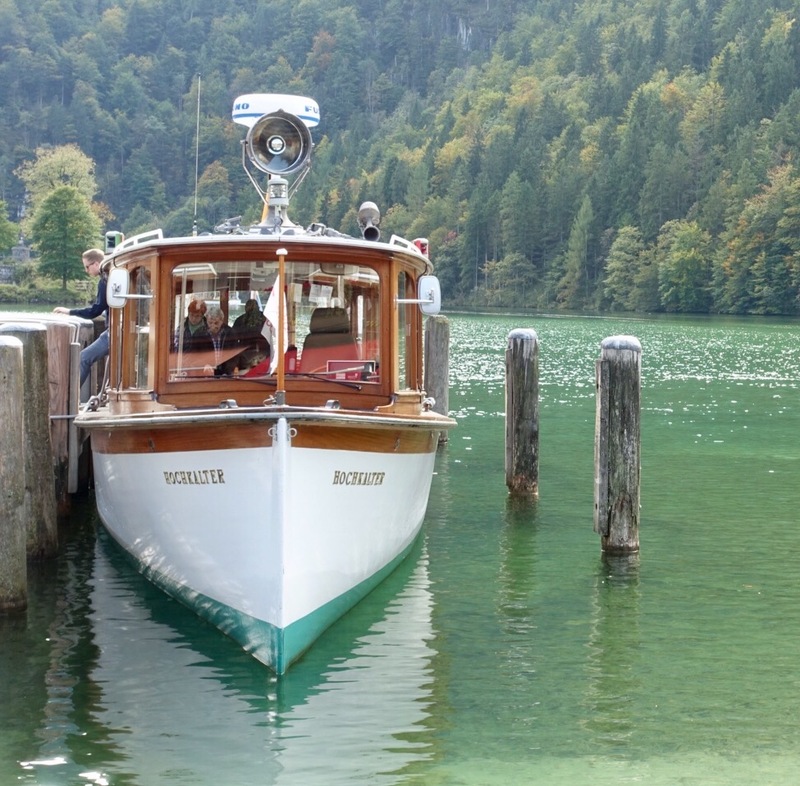 Until the start of the 19th Century, it was the summer seat for the Prince Abbott’s of Berchtesgaden. Later, the Bavarian kings designated it as their hunting castle. 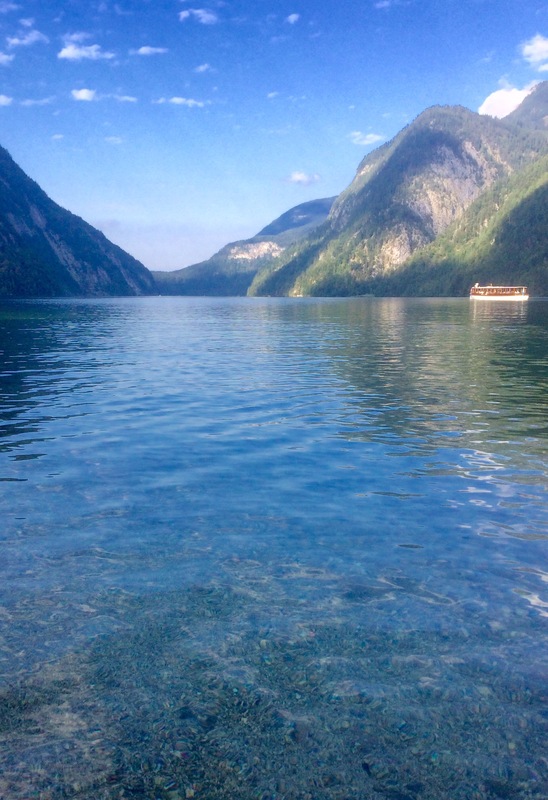 We’ve always wanted to visit the Konigssee; hear its famous echo-chamber between the Alps; and photograph St Bartholoma. So, it was a special treat to be taken on an electric boat cruise, where we marvelled at the clear waters, up to 150 metres deep on average. We also found the view of the church – set against the backdrop of snow-tipped alps – to be as beautiful as anticipated. As the boat glided across the water between massive cliff faces, its captain paused to play a note on a type of trumpet. The sound hit the nearest cliff, known as Echowand and then bounced around the lake like a gunshot. Back in the day, boats apparently did fire a pistol, which echoed up to seven times around the mountains. On top of one of the Alps at 1843 metres, is the Kehlsteinhaus – or Eagle’s Nest – which was Adolf Hitler’s diplomatic house. 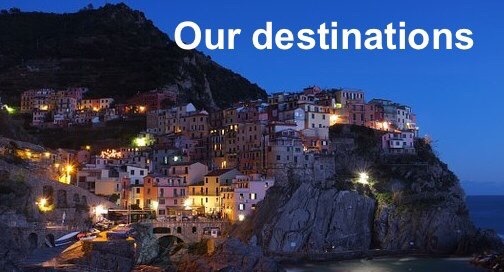 But that’s another story and another destination for us to explore. German engineering has produced some great cars. The Trabant certainly wasn’t one of them. Yet, 26 years after the last East German people’s car was made, history has indeed been kind to the Trabi. Despite being regarded as a symbol of the defunct East Germany and the collapse of the Eastern Bloc in general, the Trabi ironically, has been resurrected as a tourist attraction. During our last visit to Berlin, we found a parking lot full of the small, two-door vehicles just a few blocks from our hotel at Checkpoint Charlie. It was ‘Trabi World’, one of several such businesses where you can pay to drive your own Trabant around the vibrant German capital. We weren’t tempted to get behind the wheel, but we still wandered in to take a close look at what Time Magazine once described as “the car that gave Communism a bad name”. We’d heard how the Trabant was made of duroplast, a fibreglass-like material similar to Bakelite; lacked brake lights and turn signals; was slow, noisy and uncomfortable; and belched black smoke from its two-cylinder, 26-horse power engine. Like your average lawn mower, the Trabi engine needed a mixture of oil and petrol to run, requiring service stations to sell already-mixed fuel. 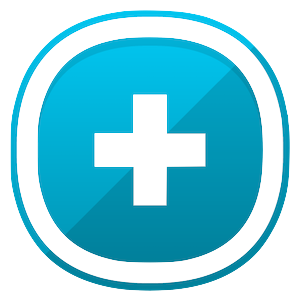 And what is duroplast anyway? Duroplast was made from recycled cotton waste from the Soviet Union and phenol resins from the East German dye industry. And, although the less-than-affectionate nickname of ‘spark plug with a roof’ seemed to be fairly accurate, when we visited Trabi World, there was still quite a line-up of people keen to experience a drive in the vehicle. A Berliner later told us that the popularity of the Trabi safaris seemed, in part, to reflect “Ostalgie” or nostalgia for elements of the old East German society and culture. Although the Trabi was an object of ridicule for many in today’s Germany, curiosity and nostalgia had resulted in it achieving a measure of cult status. As we watched Trabi safaris splutter by over the next few days, our walking guide reminded us that, before the fall of the Berlin Wall, the car was the height of luxury for East Germans. A Trabi cost up to one year’s salary and there was a waiting period of 12 months after you ordered and paid for it. There’s a story in Berlin about one East German man who ordered his Trabi and was given a delivery date exactly one year later. He stunned the manufacturers by asking whether his car would be delivered in the morning or afternoon. “It’s important” he said “because the plumber is coming that morning”. Apparently, that was life in East Germany. Despite a construction boom; remnants of Eastern bloc regulation; high levels of public housing; and heavy World War II bombing, Berlin still boasts some wonderful architecture well worth seeing. Wandering through Berlin, it’s easy to see how the appearance of the city today is largely a direct result of the tumultuous role it played in 20th Century Germany. The other key influence is an astonishing building boom that, for the past few years, has produced a skyline of cranes and literally thousands of construction sites across the city. Despite all this, Berlin still has some remarkable architecture and incredible attractions. An iconic landmark of Berlin and Germany, the Brandenburg Gate is an 18th-century neoclassical triumphal arch that stands in the western edge of the city centre in the Mitte borough. It marks an historic gateway to Berlin. Berlin’s oldest museum is located in the UNESCO-listed heritage site known as Museum Island. It was built by Karl Friedrich Schinkel – Prussia’s most influential architect – and houses the city’s Classical Antiquities collection. Completed in 1830, the Altes Museum is one of the most important buildings of the Neoclassical era. An inscription on the striking building reads: ‘Friedrich Wilhelm III has dedicated this museum to the study of all antiquities and the free arts, 1828’. The university has produced 29 nobel prize winners. Berlin Cathedral is located on Museum Island. Sitting in he River Spree, the island houses five museums built between 1830 and 1930 and was named a UNESCO World Heritage site in 1999. The Cathedral was finished in 1905, but its eye-catching dome was all but destroyed by bombing in the Second World War. It is an impressive building and a ‘must-see’ on any visit to the German capital. Berlin State Opera is on the Unter den Linden boulevard in the Mitte borough. Construction of the original building on the site began in July 1741. On August 18, 1843 the building was destroyed by fire and then rebuilt only to be badly damaged again in the Second World War. This a sample only of Berlin’s architectural attractions. Visitors to this vibrant city would be wise to also spend time at the Reichstag building; Charlottenburg Palace; the Fernsehturm (TV tower), at Alexanderplatz in Mitte; Alexanderplatz in general; and the city’s many fine museums and memorials. 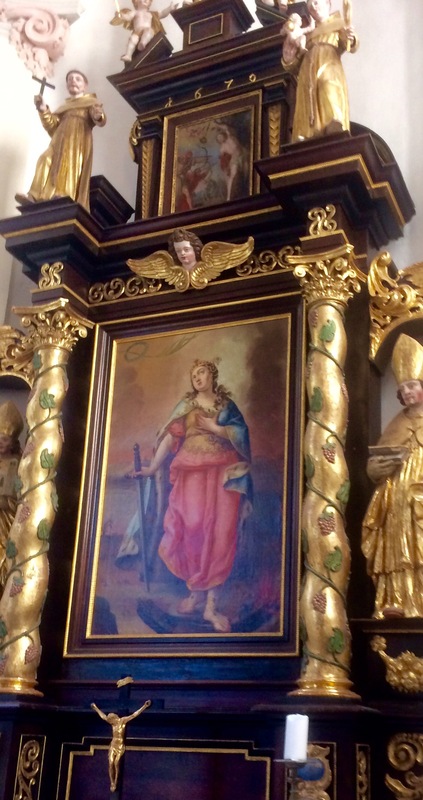 On a past visit to Germany, we were intrigued by an unusual Christmas decoration. Small multicoloured parachutes with a gift suspended below each seemed to be a key part of festive displays – especially in the eastern areas of Berlin. Asked about the meaning of the decoration, Berliners told us a fascinating story that harked back to the Soviet blockade of the city during the Cold War. Apparently, a young American pilot, who was airlifting supplies into blockaded Berlin, was touched by the plight of local children and started to drop candy from his plane as it descended to land. Fashioning small parachutes, he and his crew sent them floating down as they approached the Berlin airport, wiggling the wings of their plane as a signal to the children that their anticipated cargo would soon arrive. Word soon spread, and donations of candy and other supplies poured in from sympathetic Americans. In this way, a small idea became a great symbol of hope not only to German children in a bombed-out city, but to all those who yearned for freedom. This black and white photograph, which is in the public domain, shows a U.S. Air Force Douglas C-54 Skymaster making a candy drop (note the parachutes below the tail of the C-54) in about 1948. Although the true crime tale of the biggest counterfeiting operation in history had been revealed many times in the past, it was new to us. 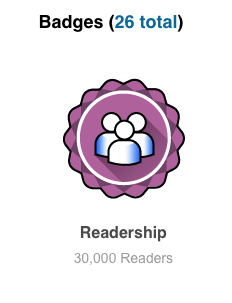 And, as far as gripping stories go, this one sure has it all. While in Berlin, we decided to travel by train to the former Sachsenhausen concentration camp, in eastern Germany. Unknown to us, this house of horrors – at the town of Oranienburg, in the Brandenburg region – was the centre of a Nazi plan aimed at bringing down the world’s financial system. 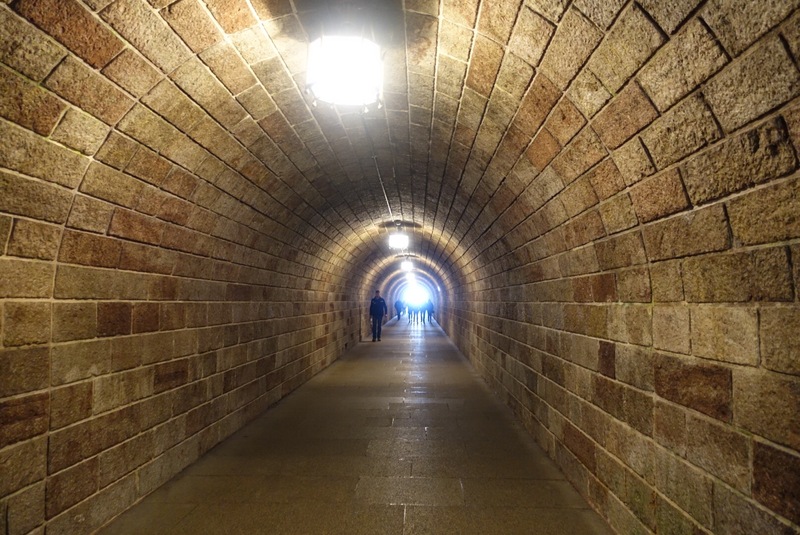 Along with ovens, gas chambers and mass graves, we heard of Block 19, where the Nazis carried out ‘Operation Bernhard’ a clandestine exercise to print hundreds of millions of British pounds. The idea was to drop the counterfeit money by plane over English cities and towns, causing a loss of confidence in the British currency. Major Bernhard Krueger apparently found forgers in Jewish death camps and set them to work at Sachsenhausen to copy British pounds – and some US dollar bills. We were told that, from 1942 to 1945, a total of 132 million pound notes were forged at Sachsenhausen – more than the Bank of England held in its vaults. Instead of using a fast-dwindling air force to distribute the money, the Nazis eventually used the fakes to finance their own espionage services. So many counterfeit pounds swamped the black markets of Europe that suspicion was cast on real British currency, which then fell in value. However, the British averted a financial collapse by hitting back with a blockade on bringing pounds into the country. Not surprisingly, the story of Operation Bernhard and the Sachsenhausen forgery ring has made its way into several books – and even an award-winning film, ‘The Counterfeiters’. It was an offbeat and far-reaching chapter of World War II – and one that kept us engrossed as we toured a chilling and sobering place.